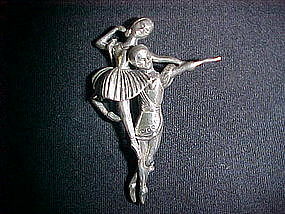 Beautiful sterling silver pin featuring a pair of Ballet Dancers. 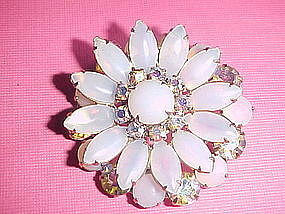 This pin was made in the 1950's by BEAU. The pin is little over 2" long and is signed BEAU STERLING. It is designed in the Art Deco form and is in Excellent condition. I chose not to polish it because this pin has developed a wonderful patina, I will let the next owner decide to leave it that way or to polish it. 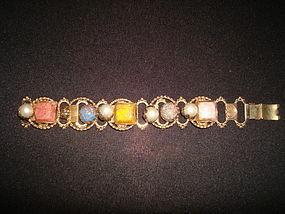 Very interesting mid century ladies fashion bracelet. This bracelet is in wonderful condition and measures 6 3/4" long and 1" wide. It has set faux stones made of multi colored glass and faux pearls. This Super 50's bracelet is sure to get you noticed!!! Super vintage ladies jewelry set. 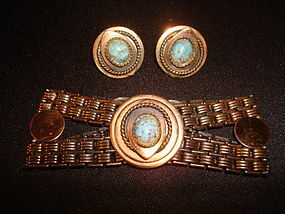 This set is made of copper and set with faux turquoise. The bracelet measures 6 1/2" long and 1 1/4" wide. The earrings are each 7/8" in diameter. The set is in fine condition with a few minor surface scratches due to many years of enjoyment. The items look much better than the picture show. This beautiful vintage set is ready to wear and be notice!!! 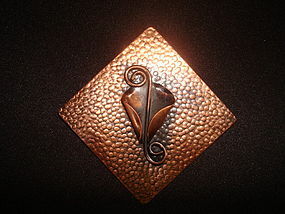 Beautiful Mid Century copper brooch with hammered background. This diamond shaped brooch measures 2 7/8" x 2 7/8". It features an applied stylized flower bud. In fine condition!!! Nice 1950's era cigarette lighter made to advertise DRY DOCK SAVINGS BANK of NY. 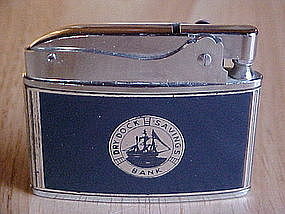 One side of the lighter features the famous Dry Dock Savings Bank Logo that includes a sailing ship. The other side features a super image of the Dry Dock Savings Bank building complete with flag and people walking in front. 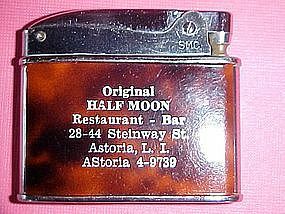 This pocket lighter was made in JAPAN by NESOR-ROSEN and is in great shape. It measures 2 1/8" long x 1 3/4" high. 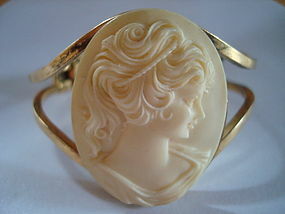 Wonderful vintage bracelet with resin cameo imitating carved ivory. This eye catching bracelet is in fine condition and has a gate lock. 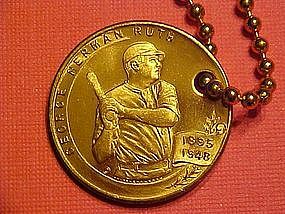 The cameo measures 1 1/2" long and the bracelet measures 2 13/8" x 2". It is sure to stand out with evening formal wear!!! Classic Cameo stick pin from 1950's. 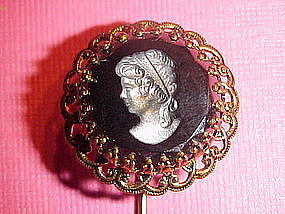 This stick pin is made of gold toned brass and has a set in black glass cameo. On the back it is signed " Made in GERMANY WEST." It measures about 3" long and it is in very fine condition. 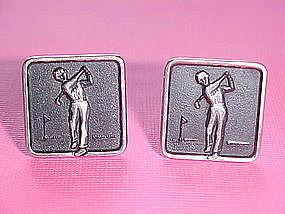 Vintage pair of Men's cufflinks featuring a golfer swinging his club. They are in fine condition and each cufflinks face measures 3/4" X 3/4". 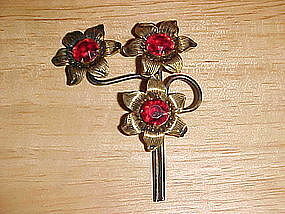 Beautiful vintage 1950's double stack flower brooch. This wonderful pin is set with pronged aurora borealis rhinestones and ovals and center round stone with pearl like irradescent satin finish. This pin is in Super condition and approximately 1 3/8" in diameter but with two dimensions!!! 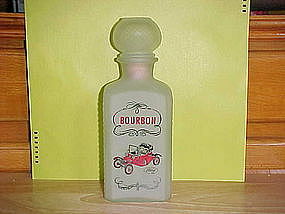 Circa 1950's Satin glass Bourbon Whiskey Bar Decanter with stopper featuring a 1910 FORD Automobile. The glass has a criss cross pattern throughout including the bottles base and the stopper. This bottle is embossed 4/5 QUART. It is 9" tall including stopper. In Excellent condition!!! A perfect gift for both Antique Car Enthusiasts and Liquor Decanter Collectors!! Circa 1950's Liquor decanter made of satin glass. 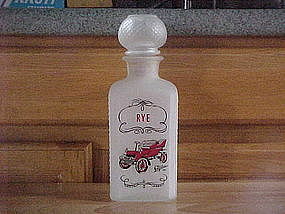 Its painted label reads " RYE " and features a 1903 Cadillac. It features a cross hatched pattern in the glass including the base of this bottle and its stopper. It is embossed 4/5 QUART and is 9" tall including stopper. This decanter is in Excellent Condition!!! It would make a great gift for Antique Automobile enthusiasts as well as collectors of Whiskey Decanters!!! 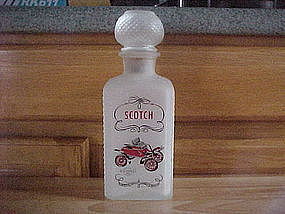 Circa 1950's satin glass Scotch Whiskey decanter with stopper featuring a 1904 Oldsmobile. This bottle with stopper measures 9" tall. The bottle including stopper and base has a cross hatched pattern throughout. 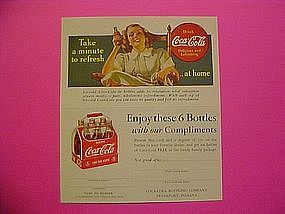 It is embossed 4/5 QUART. In Excellent Condition!! This would make a great gift for Antique Car Enthusiasts and Liquor bottle decanter Collectors!!! Circa 1950's Tin Litho FIRE CHIEF CAR with friction engine. Made in Japan and is in original packaging. 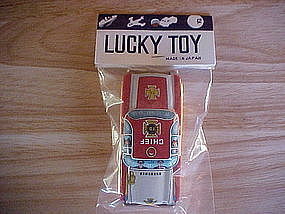 This toy is in near Mint condition. I would give it a 98 1/2 out of 100 condition due to minor storage spots. This toy measures over 3 1/2" long. And is marked "Made in Japan" with manufacturers company logo. The header card is also marked "Made in Japan." 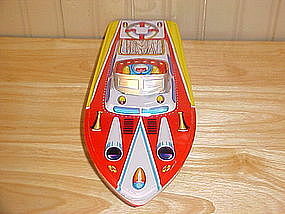 A Super toy in superb condition and over 50 years old!! !